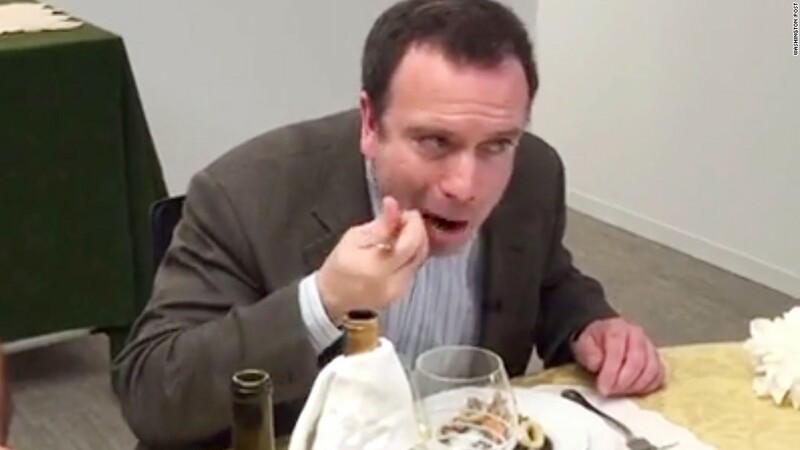 Midway through his newsprint feast on Thursday, Washington Post columnist Dana Milbank was asked if he would have preferred to have dined on crow. "The problem is they eat a lot of roadkill," Milbank said. "It's hard to get a high quality crow these days." So newsprint it was, voluntary penance for an errant election prediction Milbank made in early October. At the time, Milbank wrote that if Donald Trump secured the Republican presidential nomination, he would "eat the page on which this column is printed in Sunday's Post." Rather than welsh on that pledge, Milbank and the Post made the most of his pratfall. Victor Albisu, the head chef at Washington, D.C.'s Del Campo restaurant, prepared an eight course meal for Milbank, using the October 4 edition of the Post as a central ingredient in each. The Post livestreamed the meal on its Facebook page from a conference room in the newspaper's headquarters. 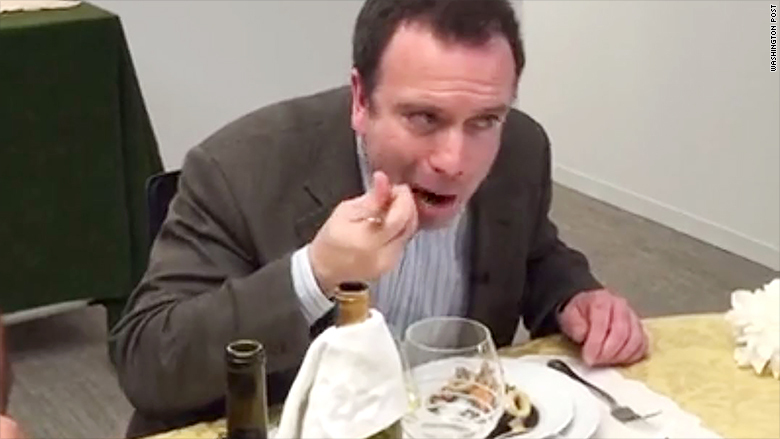 Tom Sietsema, the Post's award-winning food critic, joined Milbank off camera for the tasting. The two washed down the food with Trump's own line of wines. A bottle of Pepto Bismol was placed at the center of the table. Related: Dana Milbank, would you like those words baked, sauteed or flambéed? Th absurdity of it all was not lost on Milbank. Pointing to the army of technical personnel in the conference room, he imagined their inner-monologues. "Their thought bubbles are all saying, 'For this I went to college,'" he said. Dana Milbank eats his words. Albisu's dishes were each inspired by Trump. There was a newspaper smoked wagyu steak, served well done, just the way Trump likes it. In a nod to the presumptive GOP nominee's plan to build a wall on the southwestern border, Albisu served two Mexican dishes, including a taco bowl with grilled newspaper guacamole, a callback to Trump's much discussed Cinco de Mayo tweet. Milbank said the newspaper was hidden well in the taco bowl, just before he discovered a large strand of paper dangling from his fork. Sietsema likened it to "eating a taco with floss." At one point on Thursday, there were roughly 1,400 people watching Milbank's unusual self-flagellation -- well below the recent benchmark for Facebook Live stunts. Last month, BuzzFeed's video of two staffers tying rubber bands around a watermelon before it exploded drew 807,000 viewers at its peak. After an hour on Thursday, fewer than 900 people stuck around to watch Milbank sip on his coffee (brewed through a newspaper filter, of course). "It actually turned out to be not too bad at all," Milbank said. "Certainly not nearly as painful as it's going to be over the next six months for all of America."